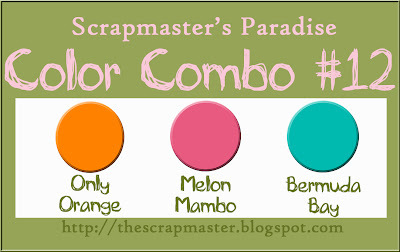 Another lovely Scrapmaster's Paradise Color Combo - up to #12. Look at these gorgeous bright colours. Makes you think of spring and summer. Once again the fabulous iCopic.com are our sponsor offering a fabulous prize for one lucky person, so play along for your chance to win. The winner this week will win a set of Copic Ciao - Set of 8 Manga Muted Colours Marker Kit and 1 Multiliner pen. This set normally retails for about $40. I had so much fun doing this one. 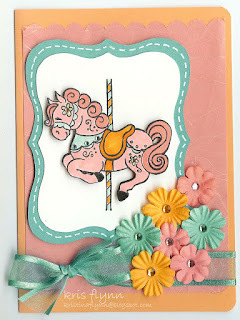 Used the cute Carousel Stamp (4010E) from Stamp-It. Also used some wonderful copics - BG01 Aqua Blue, YR04 Chrome Orange, RV23 Pure Pink. I also used the pink copic to colour in the pink flowers. Such a sweet card! I love the use of the top note die. Well done, Diva! Very sweet card. Fabulous job on the carousel horse. Great job Diva! Great Copic work. I love the card. Kristina this came out beautiful! I absolutly love this card! It is stunning. And I agree with Emily, it also makes me think of cotton candy! Wow! This is gorgeous! I love that carousel pony! The ribbon and flowers are wonderful too! Just love it!! Hey Diva!! Your card is so sweet!! Love it!! Could you possibly do me a favor? I have been trying to figure out how to show my flickr page on my blog. could you tell me how you did it? I am Danielle, from the SPCC dt. I would really appreciate it! thanks! This is so cute! So soft and baby looking.